It’s Easter! The time that means an excessive amount of chocolate, random rabbits (although any suggestion of them being put in pies WILL insight hysteria, just in case you too thought that would be a good joke) and all the Spring stereotypes as trimmings. One of the things I do find frustrating about Easter is the bloody chocolate eggs that the kids seem to gather from all and sundry. From Grandparents to godparents, random elderly neighbours and clubs that they have taken part in. The eggs. They are EVERYWHERE. 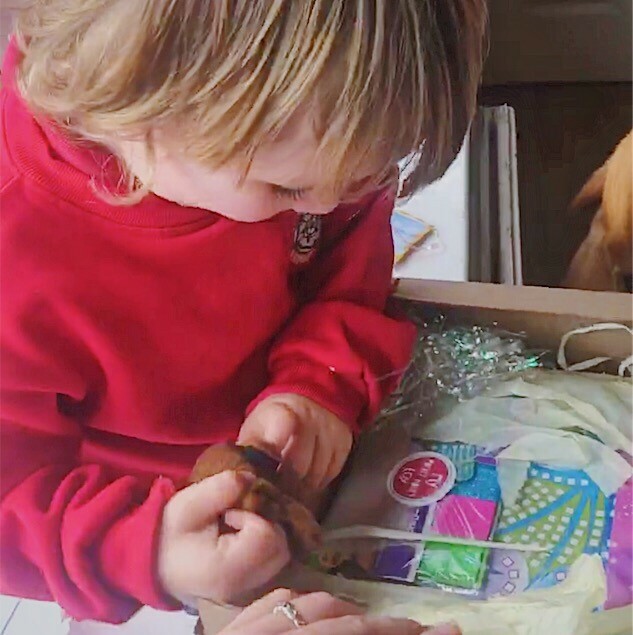 So this year, I’m recommending something that my kids have absolutely gone head over heels for, My Pocket Money Toy subscription boxes. 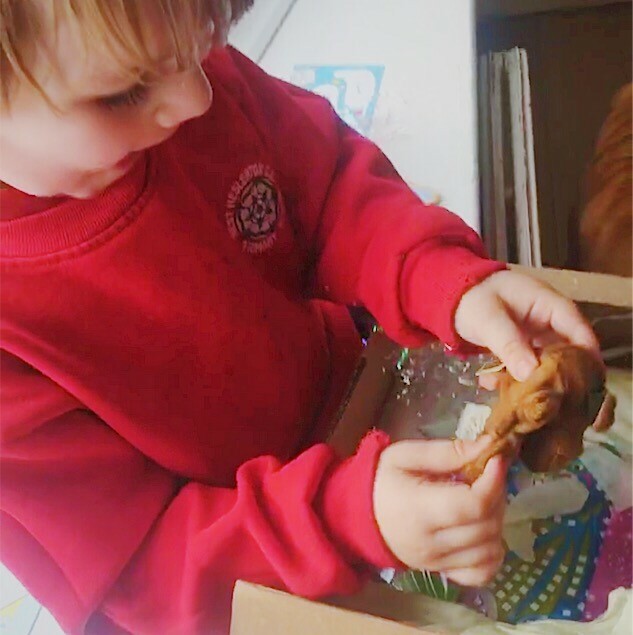 Not only are they filled with the most brilliant toys, but they come monthly as a gift through the post, something that all kids adore – hell, I get excited when I get mail (provided it isn’t a bill… which it almost always is). The boxes are tailored to age ranges 3-5, 6-7 and 8-10 which means we got to try out two of them! We asked for gender neutral boxes and didn’t really give any specifics as to what the boys like, though you can ask for “gender specific” toys and give an idea of what your child likes should you wish. 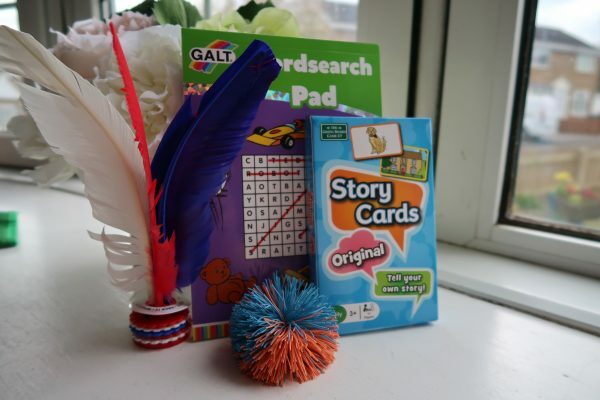 The subscription boxes are full of things that both kids and their parents love, they aren’t full of tat, there is nothing that breaks easily or the kind of rubbish that you usually find in party bags or the forlorn “pocket money” section in Toys R Us. These are genuinely good quality products from high end brands like Orchard Toys, Galt and more. Reuben received some awesome story cards which we took on the train with us and made up stories using the cards as prompts. He loved the ogo softies he got too, throwing it up in the air and catching it for ages. I was super impressed with his word search skills too – something he did unprompted! Toby received a mosaic sticker set, something we’ll be cracking on with over the Easter hols, his favourite “gift” was a puppy pocket puppet (tenner says you can’t say that after a few bevvys) and Old Macdonald Lotto from Orchard Toys. You can buy the subscriptions for 3, 6 or 12m and I really can’t recommend them enough. It’s like Christmas comes once a month! I’d give the subscription to my son who’s nearly 5. It’s always better to gift practical toys rather than chocolate. It’s great that this is a subscription and you can receive different toys every month without the hassle of going to the shop yourself and spend a lot of money. I would give it to my 5 year old daughter, Helen. Sound brilliant. My daughter would love it! I would let my 3 young sons share it. Thank you! I would let my daughters share it 🙂 Fantastic idea! My daughter, she would love one of these! This looks like such a great alternative compared to a standard easter egg! These look lovely. My little girl can’t have chocolate due to her allergies and people are always asking what they can get her instead. I might suggest a few of these. Hi Janet, why don’t you send me your details and I’ll get a box in the post to your daughter! I know how restrictive life can be with allergies. This is quite a good idea. I am sure my nieces and nephews will get more than enough Chocolate this weekend! I love the idea of giving something a bit different at Easter and these look great and lots of fun.